Though at first glance this drawing from Ms Mellon 110 in Yale may appear complex, it has a very simple structure. The two triangles of Fire (upward pointing) and Water (downward pointing) are set within a circular space. The top part of the circle represents the heavens, noted by the stars and cherubic angels, while the lower semicircle is a depiction of the earth with its hills and valleys. On the horizon we note the sun on the left and the Moon on the right. At the cross quarters the four winds blow into the central space. In the heights of the heavens we see the name of God set in a cloud. At the centre of the interlinked triangles is an orb with the seven planets set upon it. 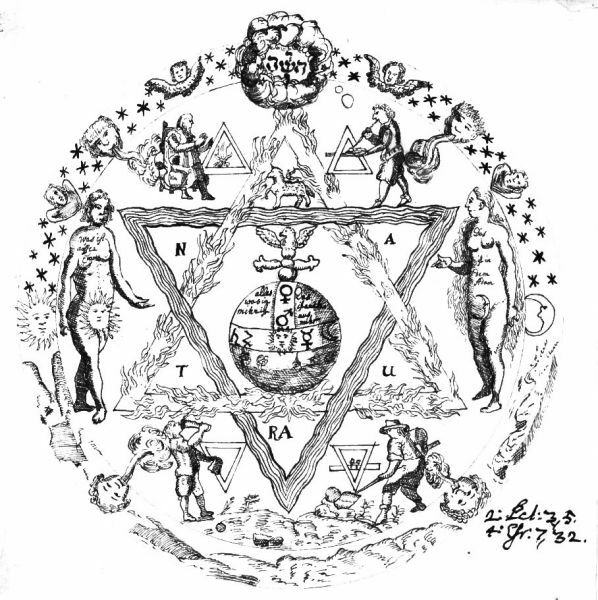 This is the same image as appeared in the coloured emblem of the book with seven seals from the same manuscript (and also in Manly Palmer Hall MS 19). Here the cross on the orb is topped by the dove of the Holy Spirit, and we note the Lamb of God, the Christ image above that forming a line to God the Father in the clouds. On the Sun or left side of the drawing is Adam while on the right Moon side is Eve. The interlinked triangles bear letters spelling out the word "NATURA". In the four corners formed by these interlinked triangles we see depictions of the four elements. At the top left an old man warms himself at the fire, at the top right a younger man seems to be blowing a bubble from a pipe, while at the bottom left a young man drinks from a flagon, and on the right a worker digs at the earth. Unlike those many alchemical emblems which constellate together an enigmatic group of symbols, this one is very straightforward and easy to read, but has a very pleasing and harmonious structure. God creates the primal elements through the triangles of Fire and Water. These create the realm of Nature, somewhat set apart from the world of the Divine. Through the Trinity of the Father, Son and Holy Spirit, the orb is placed at the centre of the world of Nature. This orb may represent the spiritualisation of the seven elements that is the stone of the philosophers. The text within it states "All that is in me, also is from me." Perhaps it is not too speculative to state this sentiment as - all that is placed into me (by the Divine) also can come out from me (through the work of Man). The references on the bottom right will be to verses from some German Bible. These are likely to be to the books of Peter and Ezra. I cannot definitely read all the text on the body of Adam - the last word is unreadable by me, but taking into account the context it appears to ask the question "Was ist ausser mich" - What is there apart from me?" This is answered by the text on the body of Eve "Das ist in dem Adam" - This is in Adam. It is possibly a reference to the Eve myth where she was made as a companion to Adam from a rib of his body. There is another illustration in Mellon 110 showing the orb. 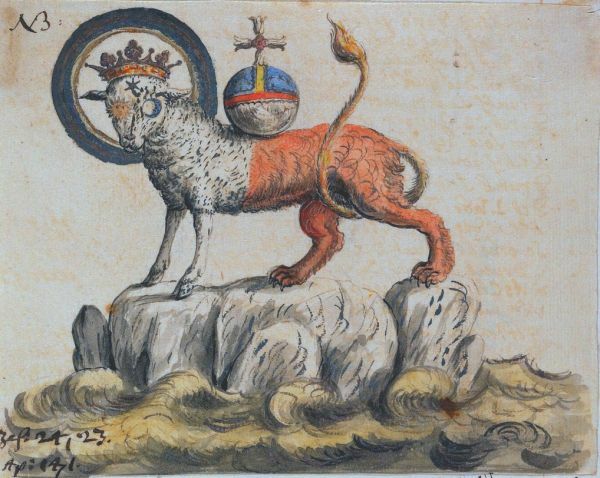 This time this is being carried on the back of a crowned lamb/lion, which has the front lamb part of its body white, and the rear lion part a red colour. Its eyes are a Sun and Moon while there is a star (possibly golden) at the centre of its forehead. One of the biblical references on the bottom left is to the Book of Revelation 14, 1. "And I looked, and, lo, a Lamb stood on the mount Sion, and with him an hundred forty and four thousand, having his Father's name written in their foreheads." I am uncertain as to the other biblical reference.